In a bit of an about face, the organisation responsible for policing the UK’s recent policy on cookies, have announced they are to stop asking users for permission to set cookies via their own website. This basically means the whole law is pointless. 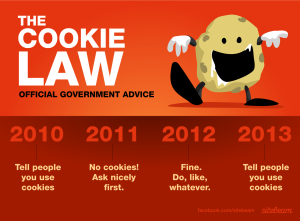 The law was hated by loads of developers, as a waste of time and causing nothing but problems, so much so that many websites didn’t even implement the recommended requirements of asking users before setting cookies. The quick answer was to just have a notice to say “we do it, using the site says you are ok with that”. The full solution was to not set a cookie until the user okayed it. Now this revelation, it probably won’t be long before the rather annoying notices start to disappear. In the short time the law has existed, it has proven unworkable and totally unenforceable. Previous Post Responsive Design: A step too far? Next Post Google Image Search Updates – Good or Bad for publishers?